Celebrate the holiday season with the Elmhurst History Museum’s annual Jolly Old St. Nicholas Concert on Friday, November 30 at 6:30 p.m. This family-friendly event at York Presbyterian Church provides holiday fun and entertainment for all ages. You’ll hear local German choirs singing traditional German Christmas carols. There will be photo opportunities with St. Nick and refreshments, too. Children can even wear their pajamas! All of us at Elmhurst Toyota encourage you to join in the fun at the Jolly Old St. Nicholas Concert. 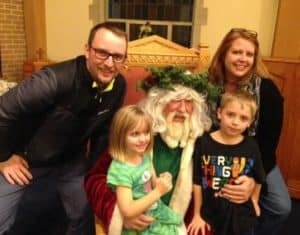 The Jolly Old St. Nicholas Concert is free for the entire family. Instead of paying an admission fee, you’re encouraged to make a monetary donation to the giving tree in support of the Elmhurst-Yorkfield Food Pantry. This organization has been assisting residents of Elmhurst and surrounding areas with food, hope and compassion for 35 years. Your donation will help feed hungry families this holiday season. There’s no registration required to attend the Jolly Old St. Nicholas Concert, now in its fifth year. It’s free, appropriate for all ages and supports the Elmhurst-Yorkfield Food Pantry. It’s a wonderful way to celebrate the season and create warm holiday memories with your family. We hope to see you there! November 30, 2018, 6:30-8 p.m. Doors open at 6 p.m.